Irons are the most versatile clubs in the bag, so maximize your time on the range learning their distances. One of the most challenging aspects of golf for many players is gaining the ability to get their iron shots airborne. The problem is only compounded when players focus too much on getting the ball in the air. The best way to launch the ball with irons seems counterintuitive: Irons generate loft by pressing down into the ball and compressing it between the face of the club and the ground. 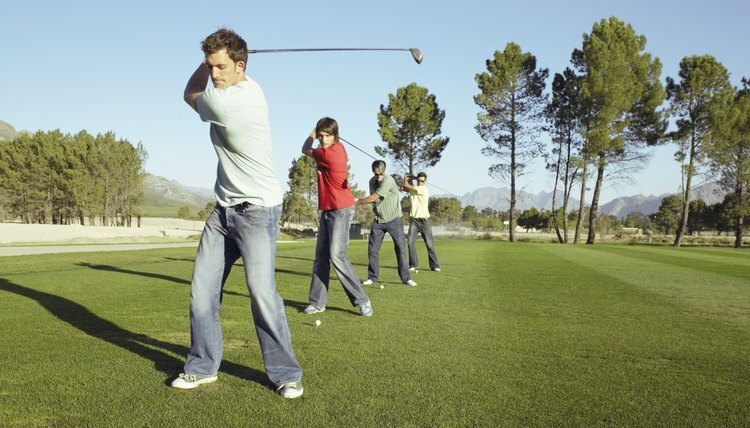 Practice your swing at a driving range with a grass hitting area, or in your yard using Wiffle balls on grass. Mats do not work for this drill because you must be able to see your divot. Place a ball down, then position a tee in line with the ball, 1 inch farther out. The tee will be used to show the location of your divot in relation to where your ball was before you struck it. Hit the ball and look for the location of your divot. The ideal spot for a divot is in front of the ball (target side) because an iron is meant to strike the ball on the downswing, not the upswing. This means the club should be skimming the top of the soil immediately after contacting the ball. Repeat the shot with a new ball, placing the ball at the back (closer to your target) of the divot from the previous shot. Continue until you hit 10 shots in a row that all create divots in front of the ball. This is a sign you are consistently hitting down on the ball. Place a ball down on a grass or mat surface and address the ball as normal. Move your trailing leg (right leg for right-handed golfers) about 1 foot behind you so that only your toe is touching the ground. Do not move your lead foot from its normal position at address. Hit the ball. Because you will be forced to keep a greater percentage of weight on your front foot, you will be rotating about the lead leg, helping to develop the feeling of rotating forward, an essential part of swinging down on the golf ball to drive it up and at the target.